Wind turbines present a serious ecological paradox. They attempt to reduce our "carbon footprint" while massively increasing our footprint on nature itself. Who decided that this is a valid trade-off? What sort of environmentalists would desecrate ancient vistas and call it Green? Nature is supposed to be easy on the eyes and ears, not an acquired mechanical taste. Turbine-pushers are wrecking wilderness acreage, historic landmarks and postcard rural scenery. Spinning white beams rarely fit in, especially when sited on ridge tops, often rising above existing landmarks. Many trees get clear-cut and large quantities of gravel and cement are used for access roads and tower bases. 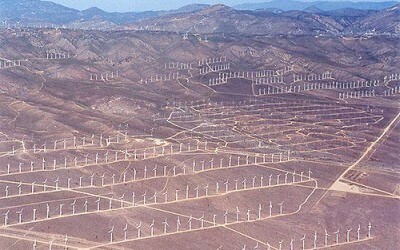 One can only hope that their favorite scenery is outside a wind resource zone and won't end up resembling Coney Island. Despite its superficially green stature, wind power is a close cousin of hydroelectric, which has turned wild rivers into canals and decimated fish. Hydro was the opposite of green when introduced (read about Glen Canyon and the Columbia River system). We are seeing a repeat of this mentality with "sustainable" towering eyesores. Just as most big rivers in the U.S. have been plugged, most windy areas could end up spoiled by industry. Wind energy just puts smaller versions of dam generators up high for all to see. There's a trend toward ever-bigger towers to maximize efficiency. Even the tallest redwoods would barely mask them. People rush to do what's technically possible and sort out moral issues later. The mechanical noise is insidious along with the visual blight. Some equate it to living among alien tripods, e.g. War Of The Worlds. These are industrial parks that radically alter what the land used to look like. Even when the blades are idle on low wind days, they loom over the scenery. That's another downside; they're intermittent, often below 30% capacity, and must be backed up with traditional sources. Apparently, not a single fossil fuel plant has been replaced by wind power, and they must be kept running 24/7 to cover dips in wind output (they can't be shut down and restarted like a hybrid car engine). This creates problems with grid monitoring and planning. 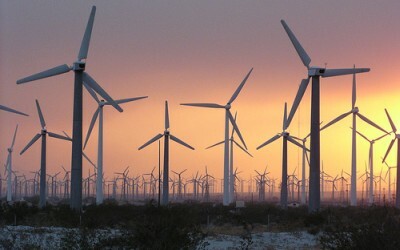 Wind also creates a free-energy mentality that may discourage general conservation. Advocates try to equate contrasty turbines with darker utility lines and phone poles, which often blend into treed or hilly landscapes. Wind turbines are very conspicuous due to height, color and motion. Their impact on vistas is also growing and cumulative. They would only be camouflaged in a perennially white place like Antarctica (slim chance of large installations there). 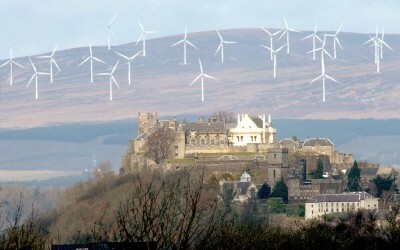 Europe is facing increasing opposition to its wind power goals, with the English countryside and Scottish mountains losing their character. 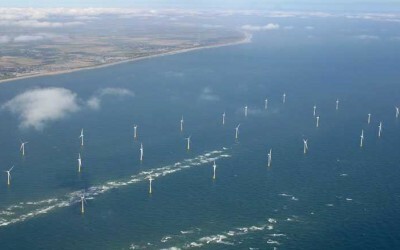 Germany is especially overcrowded with turbines. It's no small thing to wreck bucolic views with the equivalent of 400-foot spinning smokestacks. 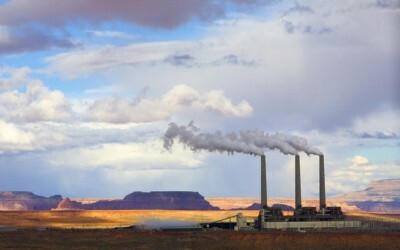 "Air" pollution isn't just about particulates. 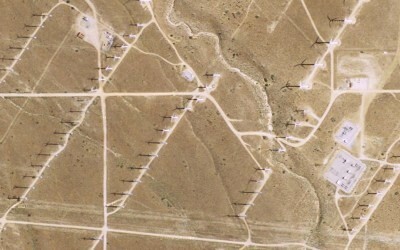 The footprint of wind installations is similar to what's planned for ANWR drilling in Alaska. Access roads and support pads end up scattered over a vast area. Nobody with mosquito bites and blood tracks on their arms would only notice their relatively small feet! Also, most oil rigs eventually come down, while wind turbines are designed to remain indefinitely, getting replaced at the end of their functional life. And construction & maintenance of turbines still uses fossil fuels. In the last days of the G.W. Bush administration they tried to push oil and gas drilling within sight of Arches National Park and other scenic parts of Utah. It was called a dirty trick by environmentalists. 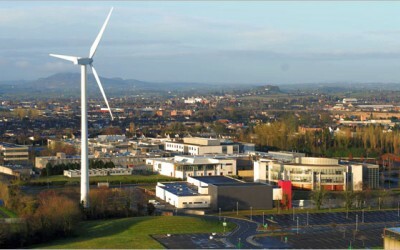 Would permanent "green" wind turbines in that viewshed cause such ire? Turbines are taller than many land-based oil derricks and far more numerous (per installation) than offshore oil platforms. This is not a pro-oil argument, just a reminder of wind's high visual price-tag and the strange hypocrisy surrounding it. The strobing or flicker effect on homes from back-lit blades is a new visual menace, like PSYOP torture. Tower lights at night cause a similar disturbance. Bird kills will remain a problem indefinitely. The new taller turbines don't appear to be spinning as fast, but it's an illusion. The blades cover a larger arc per revolution with lethal speeds near the tips. In addition, the turbines inflict constant droning, booming noises on people and animals stuck near them, even half a mile away. Property values tend to plummet when towers go up nearby. It goes well beyond NIMBY with the scale of new projects planned. Building thousands of spindly skyscrapers on untouched land is a soulless enterprise, pushed by the same mentality that accepts strip-mining. The visual impact is much wider than traditional power plants (energy generated per acre). Mogul T. Boone Pickens is right about Peak Oil, but his aesthetic values are stunted. He has proposed a corridor of many thousands of turbines cutting through America's central wind belt. It will require over a trillion dollars and create many new scars on the the land and viewshed. What's the purpose of providing people with energy at the expense of relaxing views and quiet enjoyment? Degrading the landscape defeats the presumed purpose of modern technology; to make life better. The wind-power business has the potential to desecrate more acreage than the oil and mining industries combined. 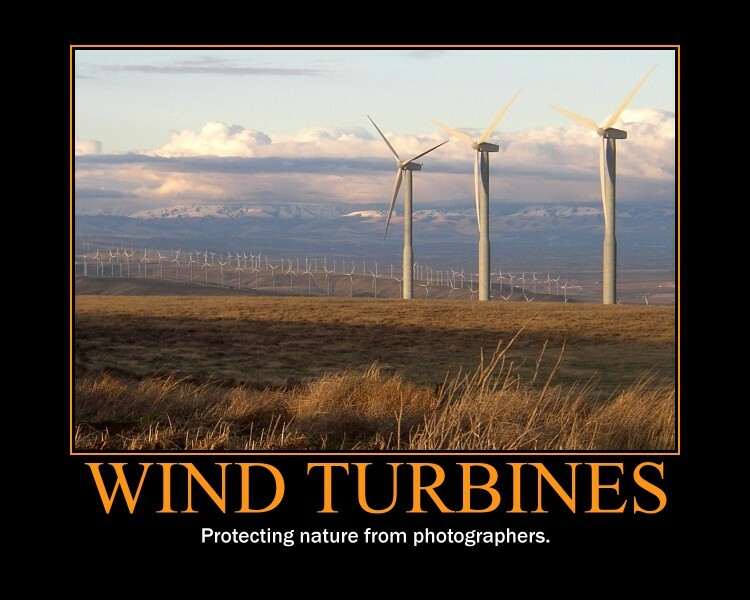 One soulless technoid in an "efficiency" forum went so far as to write: "If windmills provided a real solution to the energy problem I�d advocate covering every shoreline, every National Park, every mountain range with them." People like that show no gratitude for their ancient origins in wild places. All they care about is "meeting growing needs" and making money from same. They ought to be fenced inside Manhattan to enjoy a life of steel and concrete, minimizing their damage to the remaining natural world. Central Park would have to suffice as their wilderness. Beware of green sheep in wolves' clothing. Communities are given sales-pitches that make everything seem smaller and quieter than it is. The promise of local jobs has fallen flat since companies tend to bring in turbine specialists. Residents get paid royalties for having machines on their land, which can be like bribery. There's also the spectre of global warming shifting wind patterns and rendering entire installations ineffective. 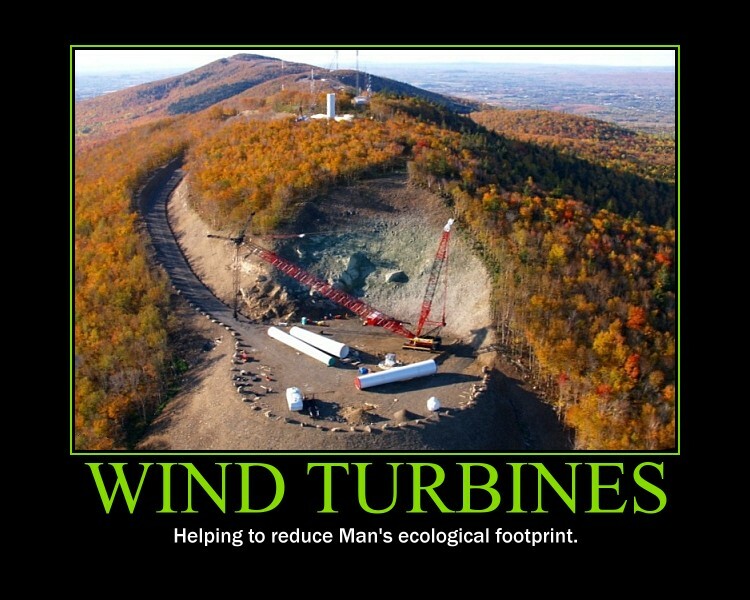 Wind power can fill some energy voids, but ruining treasured landscapes and putting roads on ridge-tops is inconsistent with environmentalism. Proponents of wind tend to be more gray than green, or tunnel-visioned energy zealots who want to try all possible technologies just because it can be done. 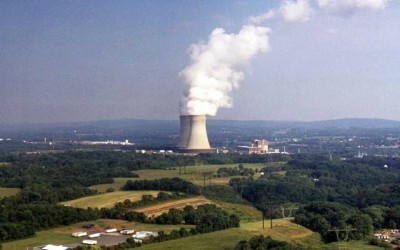 A careful resurgence of nuclear power, like portable mini reactors, and solar panels on existing rooftops would minimize new scars on the land. 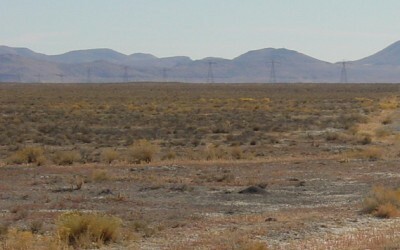 Solar farms planned for "empty" desert areas create similar scars and diminish our ability to imagine a frontier. What's life about if aesthetic enjoyment of the land becomes increasingly rare? It's the same mentality that would have everyone driving airborne cars, filling clear skies with foreign objects (space junk is bad enough). Let's leave Star Trek and terraforming on TV where it belongs. The Earth is already looking too much like Las Vegas or Dubai. 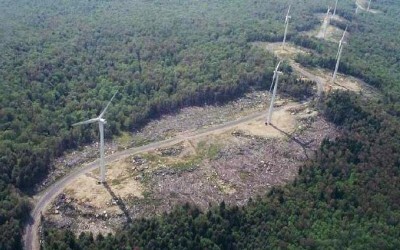 Wind projects are creating a second wave of mindless land-destruction, like that which catalyzed the original environmental movement. We can't let a new industrial ethic wipe out decades of land preservation. Instead of pushing more construction projects, effort could be put into ending world population growth and stabilizing energy demand. There is too much emphasis on "meeting growing needs" all the time. We should step back and ask what the ultimate point is. A culture of restraint should replace mindless growth and continual intrusions on the landscape. Vertical axis wind turbines (VAWT) are more efficient in variable winds, and also less of an eyesore or bird hazard. Especially promising is the helix design which captures wind from variable angles. Maglev wind turbines offer hope for reduced acreage use and much higher efficiency. 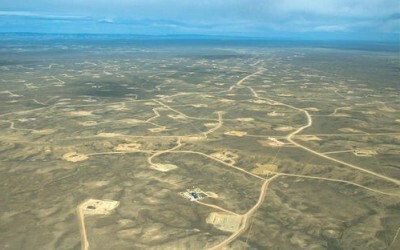 Claims promise 1 gigawatt from a 100 acre installation, which is small compared to the land-grab of standard turbines. There is a humorous side to wind turbines, but it's of the dark sort.